At less than a thousand dollars and with emitted sound at only 67 dB, the Bosch WTVC4300US from the 300 Series DLX delivers several cycle options and convenient features. The dryer in question can perform all of its functions with the grace of low energy consumption, quiet operation and minimal heat use. 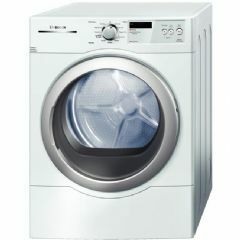 Like other Bosch dryers, the WTVC4300US makes use of EcoSmart sensors. With these sensors, the dryer is able to perform its functions with the minimum possible amount of energy. The EcoAction option further emphasizes the fact that Bosch is the 2009 Energy Star Partner Brand. This option reduces energy consumption by 10%. Because the WTVC4300US is energy-efficient, even the use of heat is at a minimal. There is even a cycle included that does not even make use of heat. The cycle is named Air Fluff/ No Heat. As for the rest of the cycles, the DynamicAir and ActiveDry features are in function. Together, these features allow the dryer to use moderate heat and high air volume to produce perfectly dried loads all the time. Other cycles included are either fabric-specific or makes use of steam. Cycles that make use of steam focus on refreshing the garments, either through a simple tumble or through odor removal and wrinkle relaxing. The 67 dB sound emitted from this dryer makes it one of the quietest dryers out there. The door hinge is reversible and can be opened easily using the right hand. This should make the WTVC4300US easy to manipulate by the majority of the population. The frame and most of the parts are in white. The color may be bland for some people, but it helps the dryer fit into most washing rooms. The tub is in durable, rust-free stainless steel. The dryer has a status indicator. The LED display makes it easy for the user to see the status. It also lends a modern look to the dryer. Using an energy-efficient dryer, which has actually been declared Energy Star compliant, the user not only responds to the needs of the environment but also to the need to save money on electricity bills. With quiet operation, the dryer is not seen as a nuisance. Even students can do their homework while using the dryer. Because minimal heat is used, there is a smaller chance of the dryer overheating. Heat sensors and controls also prevent overheating. The product comes with a two year limited warranty. It is not expected to get bust anytime soon, though. It is made of durable materials.It comes with cycles that help prevent or remove wrinkles. There are no cycles specifically designed to effectively but gently dry active wear and jeans. The product does not come with a start delay.